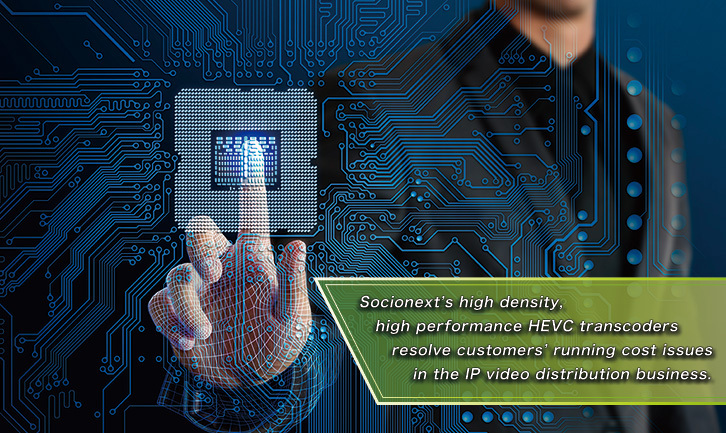 Codec for IP Video Distribution (HEVC/AVC Transcoding LSI) | Socionext Inc.
For IP video distribution with further enhanced resolution, massive transmission bandwidth is needed for the content distribution network (CDN), creating the challenge of increasing running costs, as well as the issue of storage consumed by video data. 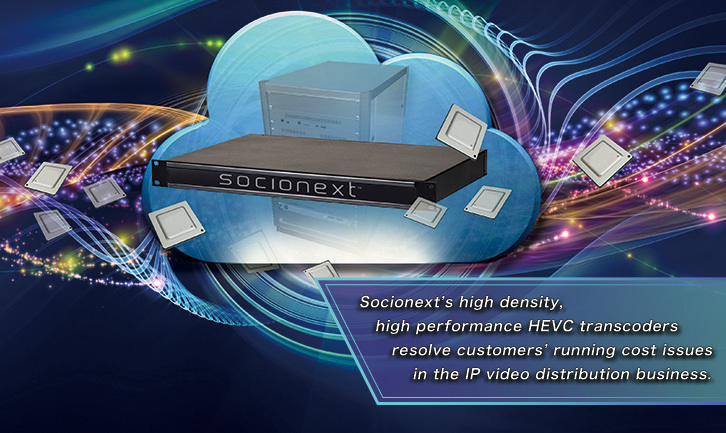 The transcoding solutions for IP video distribution provided by Socionext enables an OTT content distribution network at each distribution site optimized for customers demand, by using the multi-channel codec MB86M30 with the leading-edge H.265/HEVC compression function, resolving customers’ running cost issues. By achieving multi format, multi-channel (up to 16-ch input) transcoding, a variety of adaptive bit rates (ABR) can be provided in real-time to suit the diversity of user devices. Low power consumption, high density, and high efficiency transcoding solutions are provided from partner companies. "We understand that with the increase in the viewing of high image quality video streaming, media, telecom, and Internet companies need to reduce their equipment and facility ownership costs more than ever. Our important partner Socionext has sophisticated design technology for meeting the requirements related to power consumption, implementation density, and processing performance that are necessary for our product development. This capability of Socionext allows us to provide high efficiency transcode solutions with the adaptive bit rate (ABR) streaming function to cloud media service providers." "Video data processing and storage are our main solutions. We have a track record of providing high density storage platforms, which is the foundation for developing our new product H that integrates Socionext’s transcoder engine. We are proud of being a leader in innovation promoting high density ABR transcode solutions for data centers through optimizing quality, density and cost. We highly value our relationship with Socionext, and very much look forward to developing excellent products together with them."